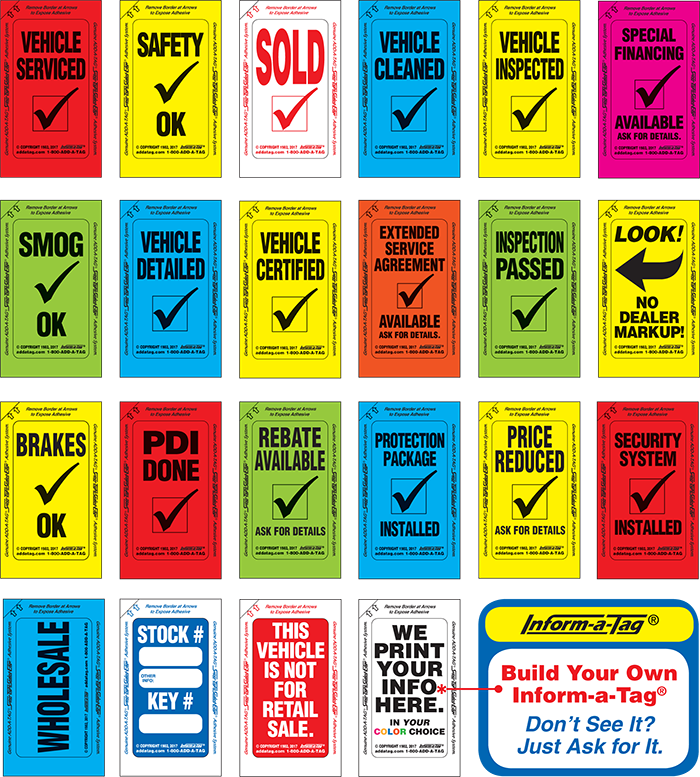 Genuine INFORM-A-TAGs® are highly-visible widow stickers that have been designed and manufactured to provide instant recognition of important dealer information. They are incredibly effective, easy to use, and offered at super-low prices. INFORM-A-TAGs® are fast, simple, yet powerful tools that quickly inform employees and/or customers of vital vehicle, sales, or service information... information that needs to be made very obvious, or emphasized very quickly and conveniently. Our design engineers have determined that their size of 2 inches by 3-1/2 inches provides an ideal combination of convenience and powerful visual recognition. In addition, our available Ultra-Visible™ Color Technology boosts color vibrance and increases visual recognition. All INFORM-A-TAGs® feature the world’s best SUPER-TIGHT-SEALED-EDGE® Full-Border Adhesive System and our Fade-Resistant Technology. Eye-popping and attention-grabbing INFORM-A-TAGs® get your information across fast, and can be conveniently placed in the corners of the windshield, side windows, or anywhere you want important, highly-effective rapid recognition. Choose from our wide selection of INFORM-A-TAGs® or we can create BUILD-YOUR-OWN custom INFORM-A-TAGs®... either way, they’re all super-inexpensive. “When it comes to instant at-a-glance information, Ultra-Visible™ INFORM-A-TAGs® are the perfect solution.” ... GUARANTEED! ★ © Copyright and ® Registered Trademark: Yes - with U.S. Patent and Trademark Office, Washington, D.C.
(in multiples of 50) to achieve volume pricing.